John makes the case that radio broadcast is baked into the recipe of American culture. 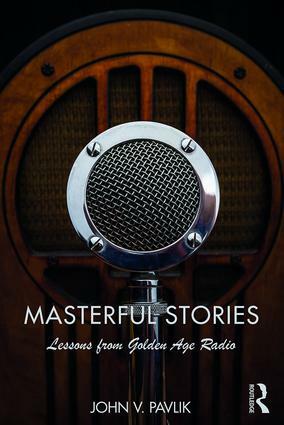 He shows how The Golden Age of Radio is a template for today’s quality Podcast and radio story telling. Podcasters wanting to build and hold on to audiences have much to learn from this book. "As an old Brazilian professor, I’ve been following John Pavlik’s career for many years. He is an international reference mainly for studies about the future of Journalism and New Media. Now, to my surprise, he is reaching back into the past. But instead of just examining old time Radio, Pavlik is in fact announcing a new "Golden Age of Internet" with ample access to the best in digital memories and archives. This is innovative and creative thinking; in summary, this is a "masterful book". John V. Pavlik is a Professor in the Department of Journalism and Media Studies at the School of Communicationand Information, Rutgers, the State University of New Jersey. Pavlik has written widely about the impact of technological change on journalism, media, and society. His new book offers an historical perspective on the development of storytelling in the first electronic medium of mass communication, radio.